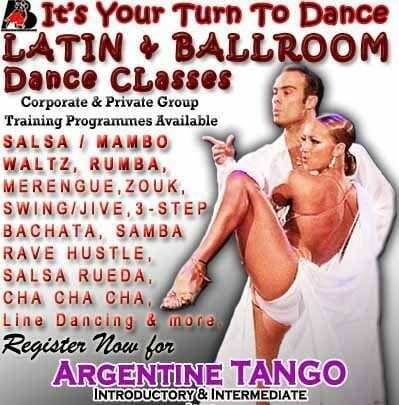 Ballroom & Club LATIN Dance Classes in Trinidad, Tobago and the Caribbean. Discover the influence of the Argentine TANGO on KIZOMBA & SALSA!!! 4 Packed Workshops followed by Special MILONGA Workshop Event! Exclusively Argentine TANGO Workshop Series and Special focus IDTA Student Medal & Tutor Certification Training Program (Optional) – Personalized “CLASS GIFT VOUCHERS” also available. Ballroom & Latin Dance Classes . . . see class schedules above . . . ! HEADS UP 1 – Lots of things to catch-up on and new ground to cover so spread the word . . . check out our class schedules and full calendar for class locations and Special Training Activities and Workshops on the various weekdays so those interested in being a part of these programmes please feel free to contact us for more details at (868) 627 4237. HEADS UP 2 – Get Ready and in gear for the “SPOT-CASH” Free-Style Ballroom & Latin Dance Challenge . . . join our Dance Programme and get up to speed to win ‘Cash on the Spot‘! HEADS UP 3 – Our Community Programme Roll-Out began on schedule with new communities and demand for trained tutors continuing to increase. FTP (Fast-Track Performance) Training will also be available on other schedules for dancers interested in Joining the Performance Team. It’s Never Too Late To Unleash Your Passions! FAST-TRACK Performance (FTP) Workshops – Series of Workshops comprising an Orientation, Performance Technique & Choreography in the Ballroom & Club LATIN Dance Styles, Rhythms & Styling and Free-Style Dance Techniques, conducted for Tutors, Performers and all dancers interested in advance free-style dance techniques, tutoring and performance choreography. Participants completing the Workshop Series will be provided the opportunity to participate at the various program levels (Focus FTP Training, Performance Teams, Tutor Teams, etc.) and the chance to Compete, Perform &/or Tutor in upcoming Special Community Events and Training Programmes . . .
Get Members Access to Tutorials Music Downloads! Dance Shoes, Gear and Accessories. Register for Free on our Members Area to access Music Downloads, Tutorials and more.